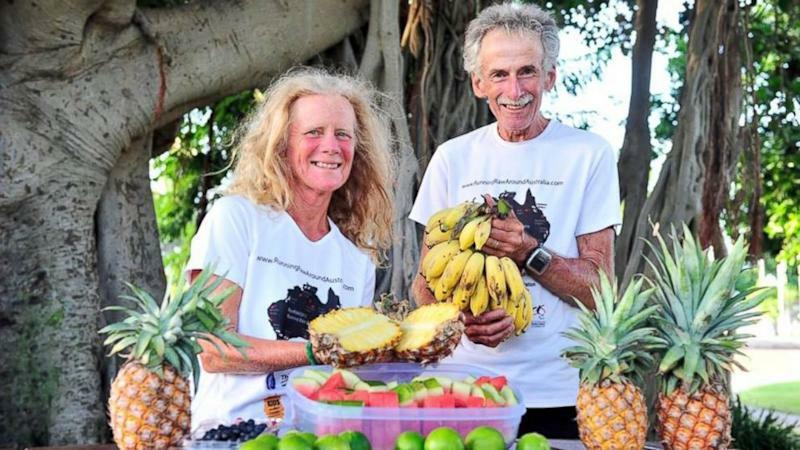 A couple in their 60s ran a marathon every day in 2013, completing a year-long run around Australia on Tuesday. And they did it all while maintaining a raw, vegan diet, they say on their website. Janette Murray-Wakelin, 64, and Alan Murray, 68, finished their 365 th consecutive marathon on Dec. 31 in Melbourne with their children and grandchildren among the 200 onlookers, they wrote on their Facebook page. Other runners began to run alongside them for the final stretch. "A very emotional moment and so wonderful to see them," they said of seeing their family. "We were quite overwhelmed with such a wonderful welcome." Then today, Jan. 1, they ran their 366 th consecutive marathon, which they say is a world record. Since setting out on their journey a year ago, they've run 9,776.75 miles, according to their Facebook page. "We are healthier, more physically fit and have unlimited energy at beyond 60 years of age than in our earlier years," they wrote on their website, RunningRawAroundAustralia.com. They wrote that during their New Year's Eve marathon, they stopped for a "banana break" and a "green smoothie." They reportedly eat dozens of bananas a day and hope to "lead by example," according to their website. They've also been fundraising for several charities, including animal and human welfare groups.